BlytheLife.com » Interview with Naomi a.k.a. Weeping Sabicu! 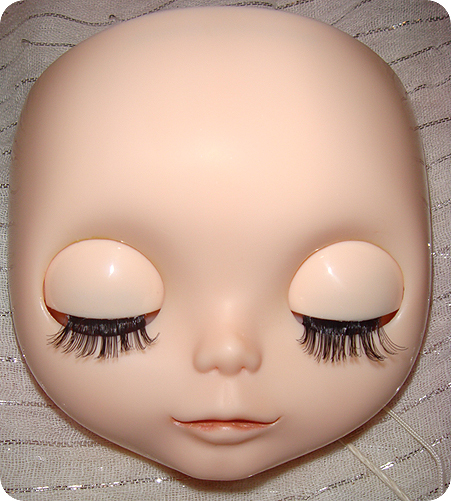 New to customizing, Naomi is better known in the Blythe community under her username Weeping Sabicu. A fellow Canadian, I was quite happy to get to interview Naomi as she offers her insights to the learning curve that exists when learning how to customize Blythe. How she manages to work up the courage to take sharp objects to a Blythe doll, I may never know, but it was still fascinating to learn how she does it and what she’s learned from the experience so far! Naomi and her Blythe, Petey Glum. Hi Naomi! What can you tell us about yourself and how you came to discover Blythe? Tell you about myself: Well, I work as a Senior Contracts Administrator for a Software firm in Calgary AB Canada. I discovered Blythe quite by accident. I was trolling e-bay in February of last year and saw the cutest custom with red flippy hair whom I eventually named Mollee made by Neroli Blythe. My co-worker saw her and said I should buy her because she kind of looked like me with the same hair colour and style. Thus the “obsession” was born. I’ve always been into dolls. My mom would buy me Dawn Dolls and Barbies and when I grew up, I was and still am a Barbie collector. I suppose I needed something new? I bought a second Blythe off e-bay around the same time as Mollee and they arrived at my house on the same day. I was fascinated by their big noggins and cool colour changing eyes and how versatile they were. 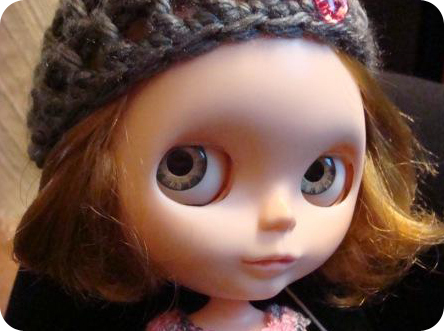 What drew you to start working on your first custom Blythe? I didn’t really intend on customizing at first. My second Blythe, Tash who I learned was a partially customized Casual Affair arrived with her face-up not being sealed and a small dent in her lips. I know now that it’s not completely kosher in the Blythe world to re-do someone else’s face-up, but because it wasn’t sealed and my original plan was only to fix the lip I didn’t think much of it. In the process of fixing her, I essentially ruined her original face up. OOPS. I hit the internet with absolutely no knowledge of what I was doing and started from there. I discovered Plastic Paradise, now Blythe Kingdom and sought help. I also joined Flickr and started adding contacts for inspiration through pictures. My original plan was only to fix her, not to start a custom, but as I got into it further, it became more and more appealing. I thought, I can do this! In progress photo of Tash. The first thing I did was to peel off the lip paint and discovered the original was still underneath, but chipped. In the process of removing her lip paint to re do it, I ended up taking off all paint! Looking at this naked faced girl, I delved deeper into how to carve lips. Not using proper tools or techniques, I just went for it. You don’t want to know what I used!! I bought four pairs of hand painted eye chips from GBaby and put them in. I asked a Flickr member how to boggle and gaze correct, and she kindly posted pictures for me so I could learn. I researched Youtube on how to remove eye chips, I found sites about customization and bookmarked them all. Tash is an on going project. She’s been sand matted, had her lashes removed, and a scalp change. In learning how to do this, I’ve discovered it helps to do things in order. I was so excited that I wanted to do it all at once, which to my dismay caused me to ruin so far three sets of lashes. I read about pastels, and sealer and currently researching how to paint her lips. I’ve had so much fun in this process that I’ve actually purchased a fully stock Blythe to do a second customization on, now that I sort of know what I’m doing and have the techniques under my belt to do a better job. What is the most complicated thing that you’ve done with your Blythes so far? Lip carving for sure! That was the most complicated thing I did to her. Considering I didn’t have the “proper” tools at the time and had really no idea what I was supposed to use. I think people would be HORRIFIED to learn that I used some items from my kitchen drawer. 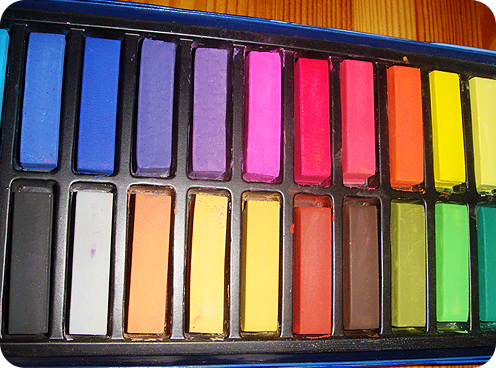 Customization tools: chalk pastels in beautiful colours. How do you set up your customizing work area? I live in such a tiny apartment that I don’t have room for an area set aside. My kitchen table doubles for my work area. It’s near a window so I get natural light in the daytime to work by. What would you say is the most important thing that you’ve learned so far to take into consideration when starting a custom project? I think the most important thing I learned is to gather all your supplies needed first, and to go in some type of order. I ruined eyelashes, had to re-sand, had to remove paint, lost screws, and killed a t-bar all because I didn’t plan my “attack” as it were. I know now to sketch the idea out or write it down first. For me, to write down the order in which I need to do things also helps to prevent wasting materials. I have a set plan for my second custom and although I may not start it for awhile, I know what I want her to look like. This first custom taught me that I can indeed do it, and I’ll be smarter and more organized with my second attempt. Be truthful now, how nerve wracking is it to put hot glue sticks to an expensive doll’s eyes? OMG, SO NERVE WRACKING! The first time I did it, I thought I was seriously going to break something. I found that the RBL I did was way easier for some reason to get the chips out than my EBL, which I have yet to succeed on. Also, the first time I did it, I melted the glue stick too much and the glue went everywhere. Thankfully I had taped the lashes and eye openings with painter’s tape or else there would have been a great eyeball tragedy! Naomi’s Mollee, customized by Neroli Blythe and hat by Naomi. 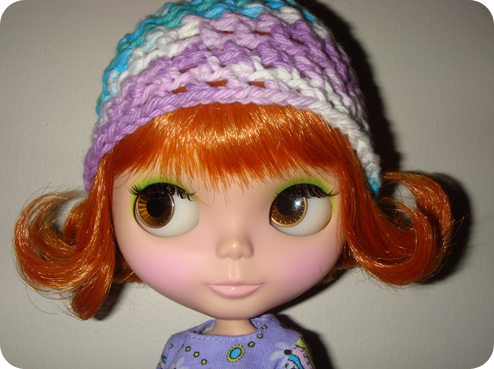 What made you persevere through the challenges you’ve come across in learning how to customize your Blythe? I like to learn new things and at first I didn’t think it would be too difficult. It has been a bit difficult, but in keeping at it, I challenged myself to do something I wouldn’t think I was capable of doing before. I’m not an artist, nor can I draw very well, but this is a creative outlet for me that I needed to try. How has learning to customize change the way you look at Blythe? Learning to customize has made me actually love the doll more. I can now appreciate the hours and hours that other customizers put in and now understand the true value of their work and creativity. 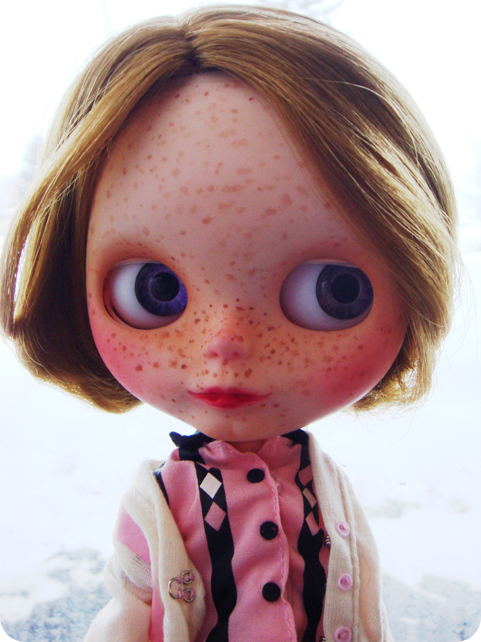 When it comes to Blythe, what do you think makes her so appealing for customizers? I think Blythe is appealing to customizers because of her ability to be a canvas for expression. She’s a quirky looking doll with her huge head and big eyes so there’s a lot of surface area on that head to do pretty much whatever you want to it. She can be a blank slate. One of the many faces of Naomi’s Tash. What’s something that you’re looking forward to learning how to do when it comes to customizing? I think the most exciting thing about the customization process for me is learning how to carve lips. I didn’t really know what I was doing when I started my first, and did not use a guide or have any plan as to how I wanted it to look, I just started a carvin’. I now am researching other people’s techniques to get a better result, including what tools they use. The lips really in my opinion determine the expression of the doll, whether you wish to make her grumpy, sad, happy etc. One doll in particular (Rownan) that belonged once to Bud Loves Sissy is a great source of inspiration to me. I loved that doll’s expression and those lips I strive to learn how to do. Thanks so much for doing this interview with me, Naomi! 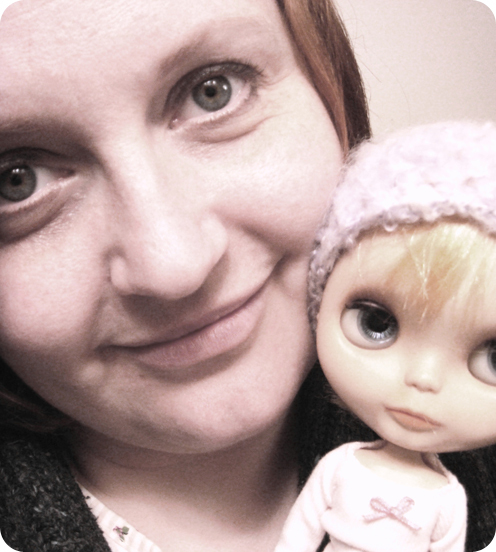 What kind of advice do you have for someone who’s new the Blythe hobby? Advice to newbies? Because Blythe is so versatile she can appeal to a range of tastes, whether you like short hair, long hair, fantasy colours, or natural colours. She can be whomever you want her to be. I would say for sure to budget! They aren’t inexpensive, and it’s incredibly easy to go crazy and buy up a bunch of them and then realize that you blew your grocery money. They are addictive. Have a plan in mind of how big you would really like your collection. Do you have the room? Do you have a display area in mind? Otherwise, I think just build your collection slowly with what you love. My collection consists of 9 now(three stock, five customs and the one I’m working on myself) For me, I purchased the ones who “sang” to me. Blythe owners are fierce in their devotion to this doll, so sometimes there can be drama. Try not to buy into that if you can and remember that ultimately collections are about what makes you happy. I’ve also met some amazing people in discovering Blythe and the community has been nothing but kind to me. I’m very much looking forward to BlytheCon 2011 in Portland to meet these people face to face and share in my newly discovered hobby. Thank you for taking a chance with me for this interview! It’s been fun! Great interview, Michelle and Naomi. This is my first time commenting, I just wanted to say how awesome it is that Naomi’s being showcased not because she’s some huge sought-after customizer, but because she brings something *new* to the Blythe community with her own sense of style. It’s very refreshing and I loved reading the entire interview, Tash looks fantastic! I love custom Blythe dolls! Naomi is very talented. The Blythe community is actually filled with a lot of great and creative people.